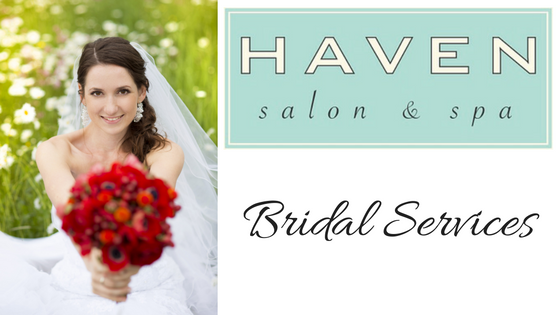 Haven Salon and Spa offers flexible bridal services to ease the pre-wedding stress and provide a radiant, photo-ready glow for the bride and her bridal party before the special day. The bride-to-be can indulge in a spa experience to revive the body and soul before the unforgettable wedding day. From massages to bridal make up, from facials to fabulous body treatments, eyelash enhancement (extensions) and manicures (to highlight that ring on your finger) we lavish our brides-to-be from head to toe. Our exclusively-created Bridal Day of Beauty is an absolute guarantee for an ultimate bridal experience. Haven Deep Conditioning Treatment with blow dry. A major credit card is required to secure your desired date and time. Cancellations must be made no later than 4 weeks prior to your event. Cancellations made after 4 weeks will incur a charge of 50% of the total cost all services scheduled. Locations outside of a 15 mi radius from Haven will incur an additional $150 travel fee. A $200 (non-refundable) deposit on a major credit card is required to secure your desired date and time. 50% of total service cost is due 8 weeks prior to your event. Final payment due 2 weeks prior to your event. Cancellations must be made no later than 4 weeks prior to your event, in order to receive a full refund (less initial deposit). 20% gratuity will be added to the final cost of services.